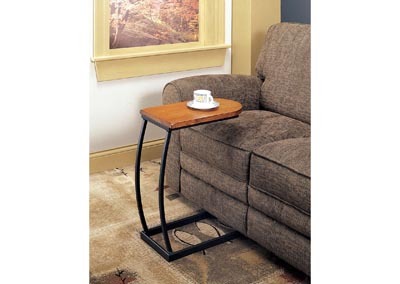 With a distressed brown top and contrasting black base, this accent table is a great addition to any space. The curved base, with supports on only one side, allows this accent table to be pushed flush with a sofa, opening up space in any room when you need it. Its convenience and versatility make this table a great choice for many different living spaces.